Hurdling is one of the most demanding events in track and field. Hurdlers must strengthen and work on several different muscles in their training. Strength training for hurdlers generally focuses on exercises for the hip flexors, calves and lower back. Track and field coach John McNichols recommends hurdlers perform Olympic lifts to add the explosiveness you need when hurdling. All of the lifts are compound exercises, involving multiple muscle groups.These include bench presses, squats, deadlifts and hang cleans. The bench press works the upper body; the squats, the legs; deadlifts work the back and legs and hang cleans work the hips, knees, shoulders and elbows. Core strengthening involves all of the muscles that stabilize the spine and pelvis, not just the abdominals. Sports Fitness Advisor says that these muscles are important because in sports they increase power output, from the core through to the legs, arms and shoulders. It's all part of that explosive strength you need to bound over hurdles efficiently. There are endless ways to train the core, including incorporating one-legged versions of standard lifts or lifts that are performed on surfaces other than the standard bench. Sports Fitness Advisor recommends incorporating stability balls, medicine balls and balance boards to force the core to help balance the body during weightlifting. Improving the flexibility of your hips will only work in your favor when lifting your legs over hurdles. Strengthen the hip flexors with resistance band adductor movements. Attach a resistance band to your ankle and pull your attached leg across the front of your body over your other leg. In addition, there are some adductor training machines that work the same muscles. Calf raises train the calf and lower leg muscles. A variety of raises can help, all of which involve rising on your toes and forcing your calves and toes to support the weight. Squats and deadlifts also train the hip flexors for explosive movement. 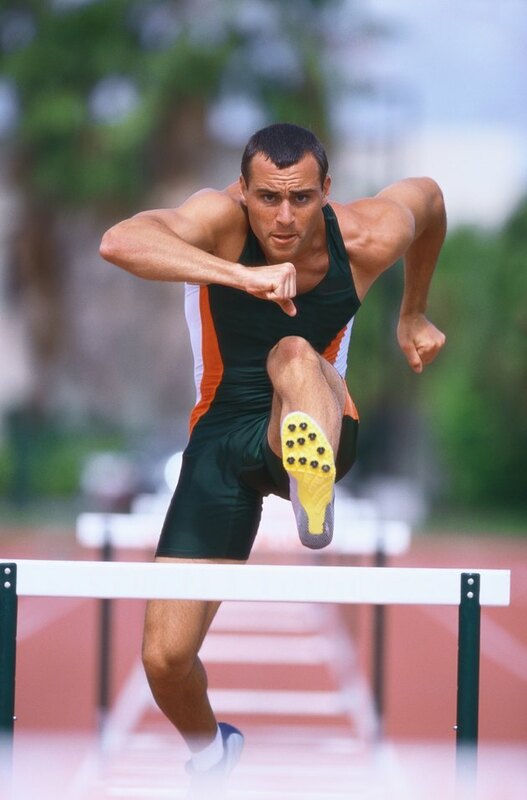 Performing actual hurdling events and sprinting with weights or resistance can help build strength for the activity when the resistance is removed. A variety of training tools exist including parachutes, weighted vests, ankle weights and sleds. All of these force the athlete to pull the extra weight and build up the specific muscles used in hurdling. Work into these movements slowly so that your muscles can adapt to the weight and avoid injury. Which Muscles are Used While Squatting with Weights?